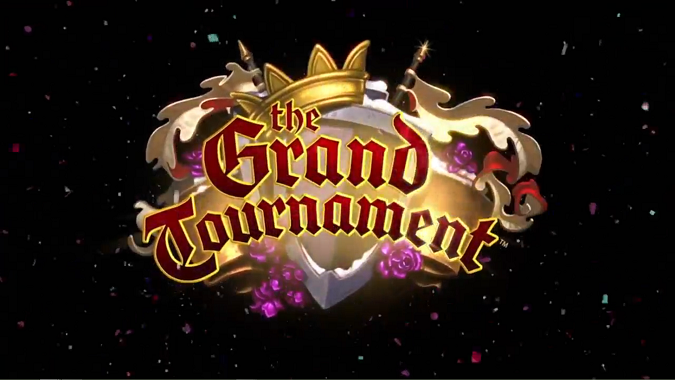 Blizzard has just announced the next Hearthstone expansion, The Grand Tournament. As far as the story is concerned, this is a continuation of the Argent Tournament — what took place after the Lich King fell. Might as well keep the tournament grounds useful, after all! This new Hearthstone expansion features a brand-new board, as well as tons of new cards. Cards feature characters on mounts, and new spell cards as well. Lock and Load is a new Hunter card that draws a random Hunter card with every spell cast. The card includes some new animation — a scope zooms in on the board. There’s also new mechanics involved with the next expansion — heroes are a big deal in The Grand Tournament, so there are going to be a ton of new cards that affect Hero Power. For example, Maiden of the Lake is a 4 mana card that makes your Hero Power cost 1, and she has two attack, six health. A new Mage card is the Coldarra Drake, which allows you to use your Hero Power any number of times, 6 mana, 6 health, 6 attack. The potential for combos is huge! The Frost Giant is a 10 mana card with 8 attack, 8 health, and costs 1 less for each time your Hero Power is used in the game. Many of these cards are balanced around this mechanic, but there’s another mechanic being added with the expansion as well. A new keyword is being added to the game: Inspire, which means that the card has a power that triggers the card effect every time you use your Hero Power. For example, Nexus-Champion Saraad is a 5 mana card with 4 attack, 5 health, who has an Inspire ability that adds a random spell to your hand. So every time you use your Hero Power, you get a spell card. The expansion has over 130 new cards, at the same price point and cost as the Goblins vs. Gnomes expansion. Pre-purchase for the cards opens up next week. You’ll be able to buy 50 packs at a discounted rate, and the purchase comes with a special Grand Tournament themed card back. You won’t be able to open the cards until The Grand Tournament is available, but you won’t be waiting long — The Grand Tournament releases next month.